In Hollywood, being the child of a famous actor or actress can work out in one or two ways – you can either be stuck having to live up to your father or mother’s name, stuck in a loop where you use your last name to secure roles but you also have to live up to the talent and influence of that last name or break away from the name and try and achieve something on your own. Both are hard paths to tread, especially the second where it is hard enough trying to get a head start in Hollywood by yourself, talk more of doing so when the industry knows you are playing a strong independent actor who needs no daddy or mommy. Thankfully, when you are the child of possibly the most beloved actor in existence, neither of the options are your problems. This is the life of Colin Hanks. Read more to learn more about him. Colin Hanks was born on November 4, 1977, in Sacramento, California. When he took his first breath, he became officially the first child of Tom Hanks and Susan Dillingham. Although he was born and it read Colin Lewes Dillingham on his birth certificate, he had a name change when his parents married a year after his birth. He’s of Portuguese and Jewish descent and the first of four children born to his father – a sister, and two paternal half-brothers. For his education, he attended Sacramento Country Day School. Although Colin Hanks attended two universities – Chapman University and Loyola Marymount University, he never graduated from any of them. What might explain Colin’s decision is watching his father’s life as one of the most respected and celebrated men in the country. The pursuit of a lifetime of similar recognition may have inspired him to drop out and become an actor. He got his first role in That Thing We Do, a 1996 film. After his acting debut, there was a lull for three years until he secured his first big break in 1999 on the show, Roswell. Collin played Alex Whitman on the science fiction series and was a member of the main cast for the show’s first two seasons. When the show ended, having gotten a chance to impress several producers and studio bosses with his acting ability, Colin Hanks starred in films like 11:14, Standing Still and 2005 blockbuster, King Kong. On television, he kept getting roles as a guest star until 2010 when he was cast as Jack Bailey, a lead role in The Good Guys. The following year, he was in a recurring role on the show, Dexter for 12 episodes. While Colin’s filmography and accolades do not rival his father’s, he has accrued an impressive list for himself that shows a range in character ability and directorial work. He made his directorial debut in All Things Must Pass, a documentary about Tower Records that was released in 2015. His other directorial work includes an episode of Key & Peele, The Anti-Mascot and The Amazing Adventures of Wally and The Worm. So far, Colin Hanks has 29 film credits to his name and 25 television projects. He has been nominated for six awards, including a Golden Globe nomination and Primetime Emmy nomination for his performance on Fargo. Outside of film, Colin is part of the group of vocal critics of the Trump administration. He is known to use his Twitter account to regular express opinions about the US President and members of his cabinet. Colin is a big baseball fan and he supports the San Francisco Giants. An all-around sports lover, he is also a fan of San Francisco 49ers, Sacramento King’s and Los Angeles Kings. Is He Related to Tom Hanks? A question that answers itself just by looking at him. 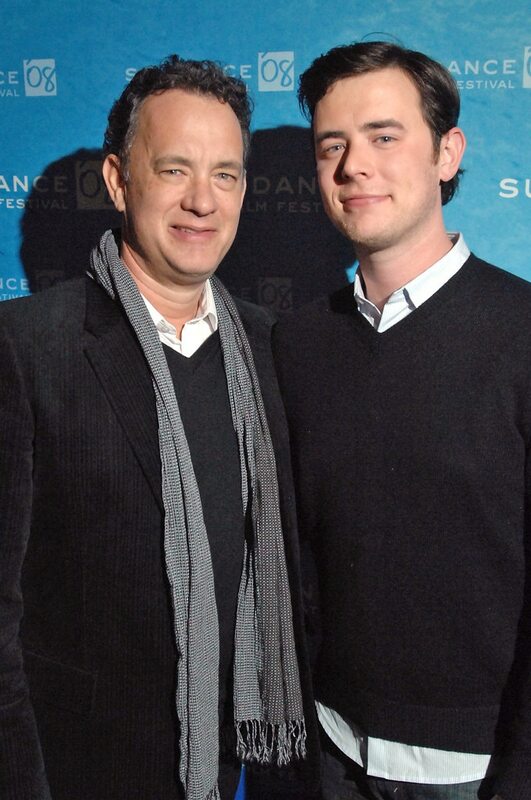 Colin Hanks is the first son of Tom Hanks. He bears a strong resemblance to his superstar father. The actor was born to his father on November 24, 1977, and his mother Susan Dillingham. Collin lost his mother to cancer in 2002.
Who Is His Wife, Samantha Bryant? Having dated a few women in college and high school, including Busy Phillips in the 90s, Colin Hanks married his wife, Samantha Bryant in 2010. The couple was engaged for about a year before they tied the knot in Los Angeles. Samantha Bryant is a former New York publicist, production assistant, and actress. She retired from active Hollywood career in order to be a mother. The couple has two children – two girls born in 2011 and in 2013.